Tag Archives for " Sam Decker "
Thursday is guest post day here at Duct Tape Marketing and today’s guest is Sam Decker- Enjoy! We are currently witnessing an exciting evolutionary step in marketing as marketers learn to better leverage user-generated content at their disposal. As this graph showcases, in the beginning, brands focused on growing their social audience as a means of reaching out to more people with traditional marketing messages on nontraditional platforms. Then, marketers went a step further by using various calls-to-action to encourage brand conversation on the social networks themselves. We are now at the stage where brands are compelled to surface valuable pieces of user-generated content across other digital touchpoints—such as on landing pages, mobile applications, in venue, or on television. This ability to surface the right content in the right place is known as converged media. Converged media refers to a company’s paid media buys, owned digital properties (such as their website and social pages), and earned user-generated content working in conjunction to inform and involve the user. The value of converged media lies in the intentional blurring of lines. What used to come across as a blatant advertisement is not just an aggregation of user testimony, or photos, or a participatory experience. Good converged media strategy means the end user wants to consume and partake, meanwhile the brand is getting the benefit of unobtrusive advertising. Below are three principles to implementing a successful converged media strategy. In order to increase affinity and buzz around their brand, Hollister rallied consumers to unlock a promotional product via social interactions. The brand built a “flock-to-unlock” experience in which fans Tweeted the #InHollister hashtag to release the brand’s special deal for the day. To effectively make the most of their media resources, Hollister leveraged Twitter promoted hashtags to increase campaign exposure. The hashtag drove consumers to the Flock-To-Unlock experience, where they were encouraged to generate further earned media. Hollister incentivized social participation by promising to activate the promotion once a certain volume had been reached. This earned content subsequently directed people back to Hollister’s owned destination thus completing the paid, owned, earned, loop. The strategy was hugely successful, earning Hollister over 40,000 #InHollister Tweets and driving a 600% increase in mentions. This exposure translated into conversion as Hollister’s site sales increased by 45% from the average day. One way that brands are entering the converged media space is through social sponsorships. Brands have seen value in spending ad dollars on sponsorships as a way of tying themselves to informational, unobtrusive advertising that doesn’t disrupt the user experience. Brands can weave themselves into the greater user experience through paid sponsorships, prompt earned conversations by inspiring participations, and direct traffic to owned assets by linking from paid and earned content. AT&T did just this through their sponsorship of American Idol. 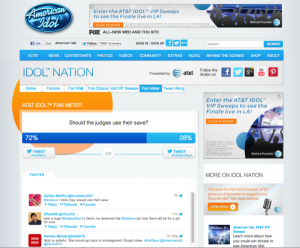 AT&T’s #IdolAgree /#IdolDisagree poll added valuable insight to an awesome and widely watched event. ATT leveraged Idol’s active built-in audience to engage with their brand in a way that actually enhanced the viewing experience of the event. Sponsorships allow brands great exposure that is contextually relevant to users. Of the total volume of Tweets around American Idol during the featured week, 27% contained one of the two voting hashtags (#IdolAgree/#IdolDisagree) that were used within the Mass Relevance visualization, sponsored by AT&T. A spike in social activity followed very (paid) on-air call-to-action. Free Cone Day is marked on the calendars of ice cream lovers around the world. To generate global awareness and buzz, Ben and Jerry’s utilized the hashtag #freeconeday to organize and inspire amplification around the special event. Scaling across multiple touchpoints and languages, Ben and Jerry’s was able to successfully generate earned media by asking fans about their favorite flavors. Using Twitter Promoted Products, Ben & Jerry’s was able to further own the social conversation surrounding the campaign by targeting the right audience at the right time with a brand-specific hashtag. This resulted in a massive social reach of over 723 million people, generating brand exposure globally to about 10% of the world’s population. 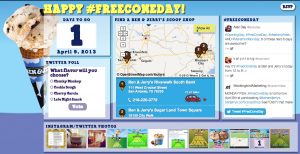 Additionally, #FreeConeDay trended in 48 cities on Twitter. 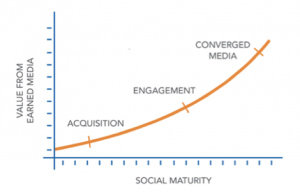 Converged media is now the ultimate marketing imperative, the new norm. You have an audience and they are talking about your brand. It’s time to make the valuable parts of this conversation visible across multiple channels to allow for further user interaction and amplification. Like Hollister, AT&T, and Ben & Jerry’s, brands must merge their paid, owned, and earned media efforts to best connect with their consumers, drive authentic content to their branded destinations, and amplify word-of-mouth beyond social channels. Sam Decker is the Co-Founder and CEO of Mass Relevance, a social experience platform that discovers, filters, and displays real-time content anywhere. Mass Relevance has worked with over 200 major brands, sports teams, publishers, and broadcasters, such as Victoria’s Secret, Patagonia, Nike, MTV, The Oscars, and NBC. 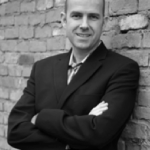 Decker has authored two books on word of mouth marketing, and he frequently speaks on converged media, consumer engagement, and social technology. Mass Relevance would love to hear from you! Contact Sam or Mass Relevance at www.massrelevance.com.